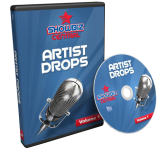 Blue Revolution has just announced Volume 12 of it’s celebrity drop-ins service ‘Showbiz Central Artist Drops’. Popular with radio stations and producers alike, Blue Revolution Artist Drops Volume 12 brings together a further 50 celebrity voices for stations to use when creating their on-air positioning. The tracklist for this latest release includes drop-ins from Ariana Grande, The Weeknd, Charlie Puth and many more. Showbiz Central Artist Drops are available as a digital download or on CD. To find out more, hear a demo or order your copy, click here.